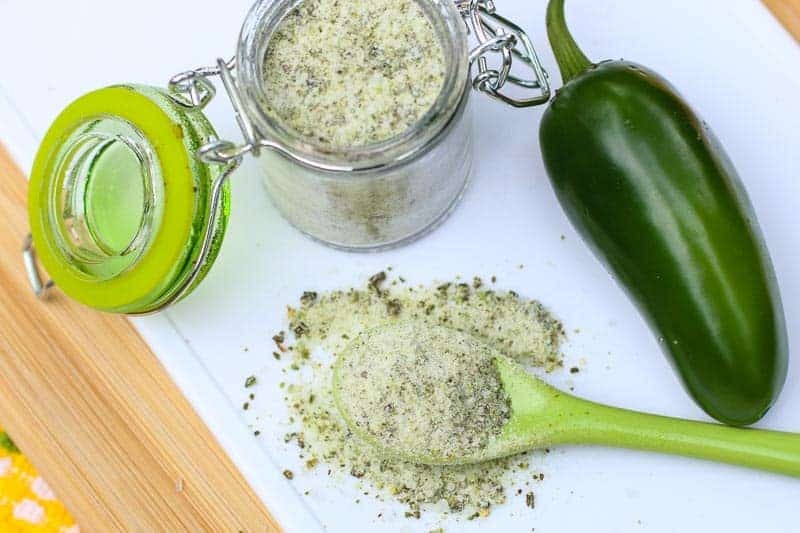 This homemade jalapeño salt recipe is easy to make. It is incredible on everything from salads, vegetables, baked potatoes, meat, pasta, and popcorn!! I am a HUGE jalapeño fan. I want them in everything, so much so, I have devoted an entire section of jalapeno recipes on my blog. When jalapeños grow fresh in the warm months, I buy huge batches and make Jalapeno Relish and this jalapeno salt. If you have a bunch of jalapeños growing in your garden, you will want to make both of these also. I promise!! When I first stared making jalapeno salt, I gave it away as a homemade gift. The friends I gave it to went CRAZY over it. I am constantly making new batches. 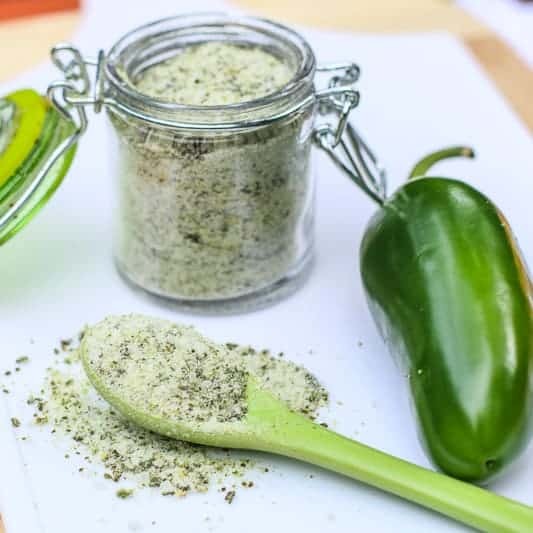 I decided to share my homemade jalapeno salt recipe on the blog so that anyone can make it at home. I honestly can’t keep this seasoning in stock very long in my home. It is so tasty on EVERYTHING. It is even great as rim seasoning for margaritas and bloody marys! and I am very happy with it. I have been using it for years. Do Not Dehydrate your jalapenos in the oven! I read that you can dehydrate the jalapeños in the oven, but I don’t recommend it. They release a powerful fume and I would imagine if you cooked them in the oven, there would be no escaping the smell…. I even recommend dehydrating the jalapenos outside. I dehydrate mine on my back porch. The fumes are very strong and could possibly burn your eyes if you get too close when they are dehydrating. The smell is overpowering. For your safety and to prevent your house from smelling like a jalapeño, dehydrating outdoors is a really smart idea. But you can risk it indoors if you are brave. Follow these tips for making fresh jalapeño salt. You are cutting 2lbs of peppers. Your skin will absorb the hot pepper juice if you don’t wear gloves. BELIEVE ME! I know from experience. It will burn your hands for days. Be careful not to rub your eye in the process…. another mistake I have made in the past. As seen in the picture, I remove the seeds for a mild jalapeño salt. There is little to no heat when you do that. You can use the salt on everyone’s food, even a child. It would have the wonderful jalapeño taste, but no bite. HOWEVER, I have also made 2 batches with the seeds…. If you like heat, you will love it this way. This jalapeno salt recipe is not for the weak-hearted. You would only make it this way for those who love hot foods. I have friends that go crazy over hot stuff, so I made the 2 batches for them and myself. The rest of my family can’t handle this version. I dehydrated my jalapeños at 145 degrees for about 15 hours. You can dehydrate yours according to your dehydrator’s directions. You will want to dehydrate the peppers until they are perfectly brittle. Throw away any soft, fleshy pieces to prevent spoilage. You will then grind the jalapenos with salt in a blender. Then, BAMB, magic in your kitchen! You will be making 4 batches like me in no time. How do you store jalapeño salt? You will want to store your jalapeño salt in air tight container. This will help maintain that vibrant flavor. I have little jars that I store mine in. I also place the seasoning in little metal containers when I give it away. Both of these help retain the jalapeno taste. Jalapeno peppers have a reputation of being hot and add a nice heat in this seasoning recipe. However, they are relatively mild when compared to other hot peppers. I have some friends that want more heat intensity in their jalapeno seasoning. If you want a hotter jalapeno salt, you can mix in red chili peppers or habanero peppers. Keep in mind that when you dehydrate the peppers, the heat does intensify. I don’t suggest adding too many in. You don’t want the salt so overbearingly hot that you can’t eat it. The jalapeno salt is meant to be a seasoning, not a hot sauce. You want that true pepper flavor. However, I personally make a few batches with the hotter peppers for my crazy friends that like their salt to burn their mouth and make them sweat. I often label it “Hot as fire Jalapeno salt,” to warn them before eating it. If you want a milder jalapeno salt, start with removing the seeds. This will tame down the heat. 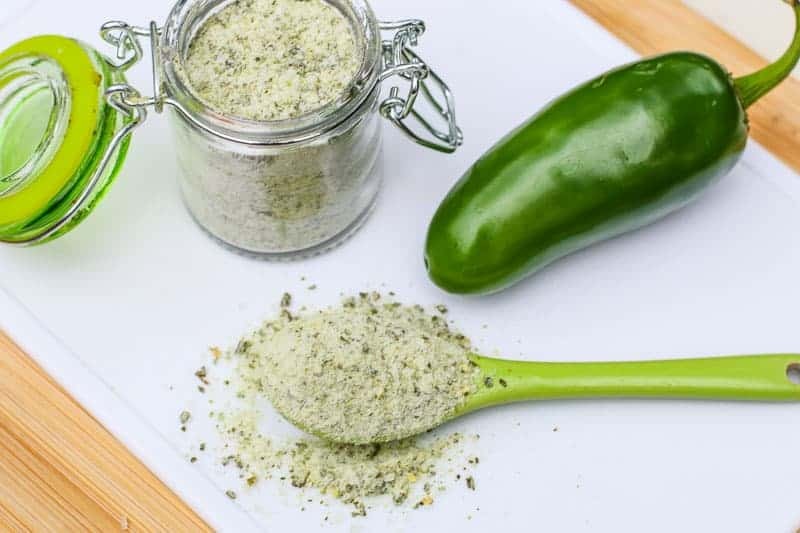 If you want an even milder salt with that same wonderful peppery flavor, substitute in a bell pepper or banana peppers for some of the jalapenos. I would still keep the majority of it jalapeños , after all it is a “ jalapeños salt;” but this will mild it down for your mouth sensitivity. I hope you enjoy this recipe. xoxo! 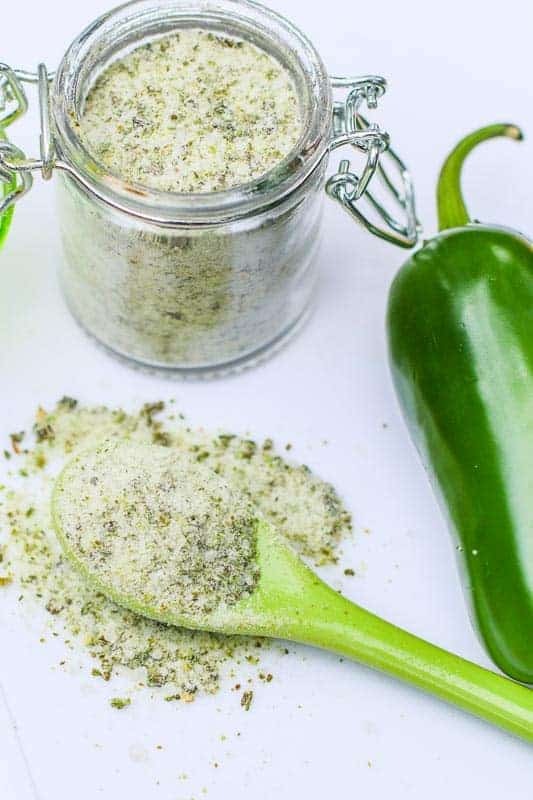 This authentic homemade jalapeño salt recipe is easy to make & delicious on everything from vegetables, potatoes, meat, & popcorn!! You will love this! Using gloves, quarter jalapeños and remove stems. If you want a mild salt, remove the seeds. If you want a very hot salt, keep the seeds. 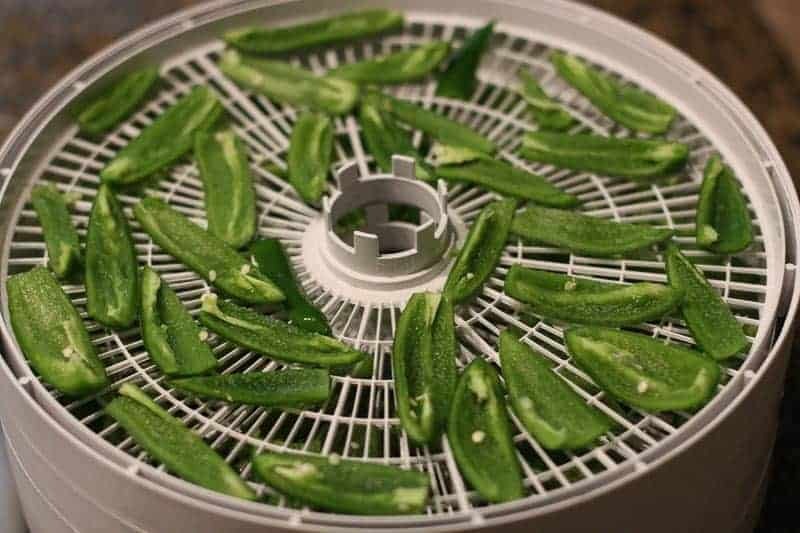 In a dehydrator, dehydrate the jalapeños according to your directions. I dehydrated the peppers at 145 for 15 hours. I recommend doing this outdoors because of the strong fumes. Check on jalapeños. They should be brittle and easy to break. Discard any fleshy soft peppers or dehydrate them until fully brittle. In a blender, grind peppers and salt until the peppers are broken down. No. Don’t use ice cream salt. Ice cream salt is not meant for human consumption. A grainy salt like Kosher salt works best. Ice cream salt ok to use? It lasts about as long as any other seasoning mix would as long as you put it in an air tight container… overtime it would loose it’s flavor. I think it is optimal to use within one year for the most flavor. This looks wonderful! I know drying the peppers and mixing with salt should create a shelf stable product that doesn’t have to be refrigerated, but how long will this keep? Until it’s used up? For instance, if I wanted to make this for Christmas gifts but use seasonal peppers, could I make batches now and they’ll be fine to give at Christmas and use afterward? You can do medium or very coarse salt. Either will work.It will become fine salt once you process it. If you use fine salt from the beginning it is much more powdery and doesn’t have the same consistency. I’m excited to make this you say corse salt. Like medium corse or like large pieces. I know we’re going to blend up but don’t want a fine salt or do I? Use a very coarse salt. Are you just using regular table salt or coarse salt? I bought those a long time ago. However, you can find cute little spice jars at World Market. Sometimes Homegoods and TJ Max has cute little stuff like that. I do not have a different option than using a dehydrator. I recommend purchasing one if you want to make this. You can find them under $40 if you don’t need anything fancy. If you dehydrate the jalapeños in the house the fumes will burn your eyes and will not go away for hours. Options for no dehydrator? Could jalapeños be dried in oven? Hi Katie, This looks like a great idea for Christmas gifts. Can you tell me where you purchased the cute spoon and jar? I haven’t measured the after dehydration, so this is a guess… but I am guessing 1 cup dehydrated. If I use already dehydrated jalapeños, how much in cups would I need to use? It’s really good on popcorn. That’s the only thing I’ve tried it on so far. 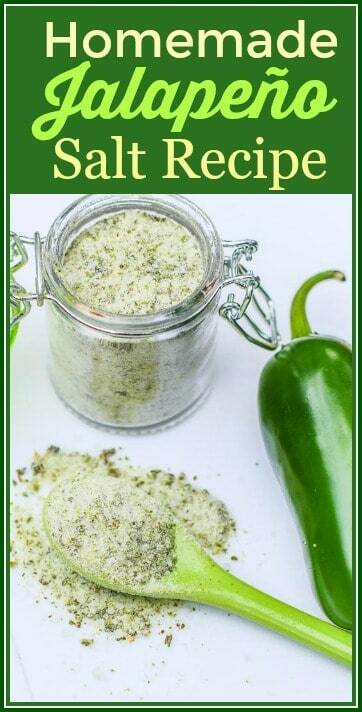 Love idea to make flavorful salt with jalapeno. Definitely on my list to try now. Thinking of all of the dishes that could use a little jalapeno salt! Great idea for a twist on seasoning! If you make a batch without the seeds, it isn’t hot at all…. You can make a second batch and mix the two together. Then you will have a nice medium blend. I do that for my friends that want heat, but don’t want to burn their mouths. I left the seeds in the peppers. Omg so hot. I did add more salt and that has helped but not much. I would also suggest that you use a mask when grinding them all up in the blender. Oh my goodness! What an amazing idea! This would be delicious on so many different dishes! I love flavored salts and need to make this one. We’ve been using a ghost chile salt my husband was given as a sample and it is waaaaay to hot, lol. I’d totally remove the seeds like you do so I can enjoy a lower key heat factor and more flavor. This salt would be a wonderful touch to salted caramel dips, yum!